Mums and asters are all over the place in the fall and, don't get us wrong, they are great plants. But there are lots of other contenders that can sail through the cold temps of fall, looking awesome for container gardens. Coral bells, also known as heuchera, are an all-time favorite container plant. They come in a mind-blowing assortment of colors and leaf textures and they are a very good-humored plant – almost impossible to kill. Some heucheras are happy in full sun, shade, or anything in between. Most are hardy down to -25 °F and perennial in zones 4 to 9. They are mounding plants and look great on their own or paired with either contrasting plants or in shades of the same color. Coral bells can look great with gourds, mums, and ornamental grasses. 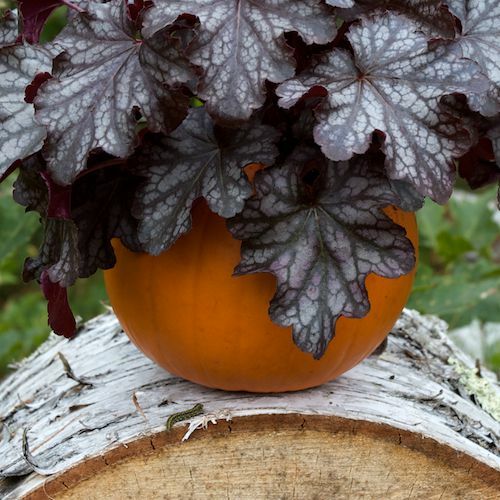 Choose a dark, almost black leaf, like 'Dolce, Licorice' or choose the lighter, 'Dolce, Peach Melba' for a terrific fall plant that works well with many fall decorations. They also look lovely when paired with pumpkin planters. Verbena is a prolific bloomer and will look good from spring well into fall. Many verbenas are hardy down to 15 °F and will continue flowering even after the first frost. 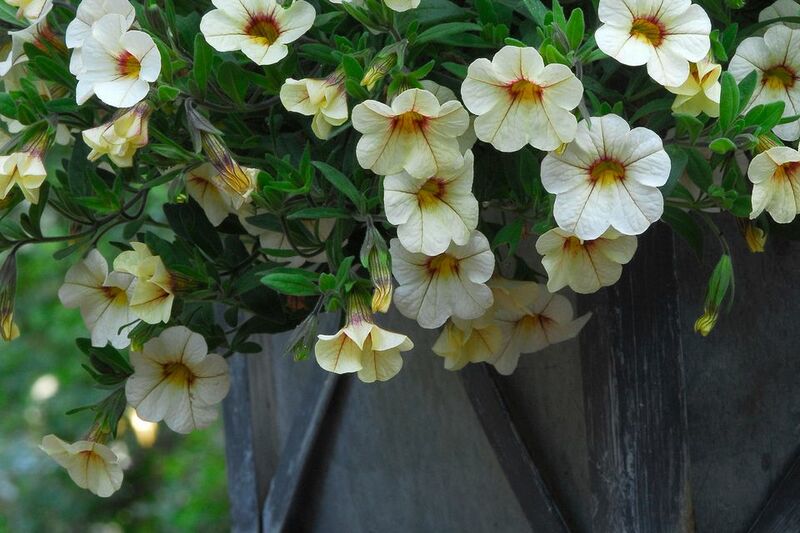 They look great either on their own or filling in spaces and spilling over the edges of garden planters, window boxes or hanging baskets. Colors range from brilliant reds to deep, dark blue to purples and pinks. They are drought tolerant and only need an average amount of water. They do need good drainage and, like most flowering annuals, verbenas need to be fed every couple of weeks. Though deadheading isn't necessary for most common varieties, your plant will look much better if you cut off the blooms after they fade. If your plant gets leggy, you will want to give it a serious haircut, pruning it way back, so it will fill out. Oxalis is elegant and, at the same time, kind of cheerful. It is exceedingly easy to grow and likes partial shade to full shade. It is hardy to 15 °F and is an annual except in zones 8 to 10. Oxalis is a mounding plant and grows to be 12 to 18 inches high, making it a good plant to use in filling out a container. It comes in several colors including a really dark, almost black, ‘Charmed Velvet,’ and another favorite, a burgundy color called ‘Charmed Wine.” Another plus about oxalis is that you can bring it inside to overwinter. Make sure you get Oxalis vulcanicola, which is not invasive. Decorative cabbages are delightfully chubby and cheerful plants, while the kales are all spiky and radical looking. However, both of these plants will take you well into fall with style and beautiful sage greens with pinks and purples. As a bonus, flowering cabbage and kales' colors only intensify as the weather gets colder, especially after a frost. We particularly love cabbages grouped together in either rustic garden planters or low baskets. They also can bring some great color and texture to mixed container gardens. Kales can look great in funky shallow baskets, window boxes or modern metal planters with clean lines. These are really bold plants, so don’t be afraid to put them in unusual containers or combine them with unlikely plants. Sedum, also known as stonecrop, is a classic fall plant for container gardens because that’s when it looks its best. Blooming in late summer to early fall, sedum is easy to grow in containers, preferring good drainage and full sun, though most will tolerate some shade. There are a vast array of sedums with different textures and flowers. Sedum is a particularly good choice of plant for a fall container that you want to leave out all winter because the dried flowers can look beautiful, especially covered with snow or frost. Sedum is hardy to a whopping -40°F and is a perennial in zones 3 to 9. Some sedum can get pretty tall so it’s great to use in the center or back of a container.